A few weeks ago, The University of Texas dedicated one of their plazas to the legacy of Walter Cronkite. 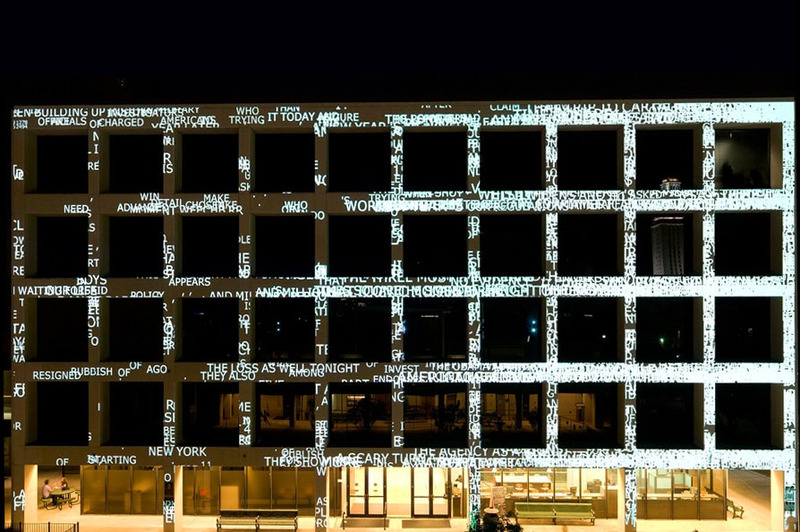 The newly named plaza was debuted along with media artist Ben Rubin’s (previously here) art installation titled And That’s The Way It Is; a digital interface that intertwines transcripts of Cronkite’s legendary broadcasts with contemporary journalism, projected in a beautifully choreographed manner (reminiscent of Jenny Holzer’s work) as compositions of moving text, onto the façade of the CMA building, overlooking the Walter Cronkite Plaza. The profound differences between Cronkite’s world and ours are felt as the projection evolves, both in their content and manifestation within Rubin’s piece. For the Cronkite transcripts, Rubin slows the pace and allows the text to move slowly up and down the CMA with fully legible quotes. When projection segues to live news feeds, the text flies across the building, occasionally as just snippets of stories and other times with full news coverage. The words overlap and eventually become so dense that the overwhelming presence of media becomes the dominant character in Rubin’s piece. Rubin accurately portrays this amassing of information and reinforces the oversaturation of current journalism. 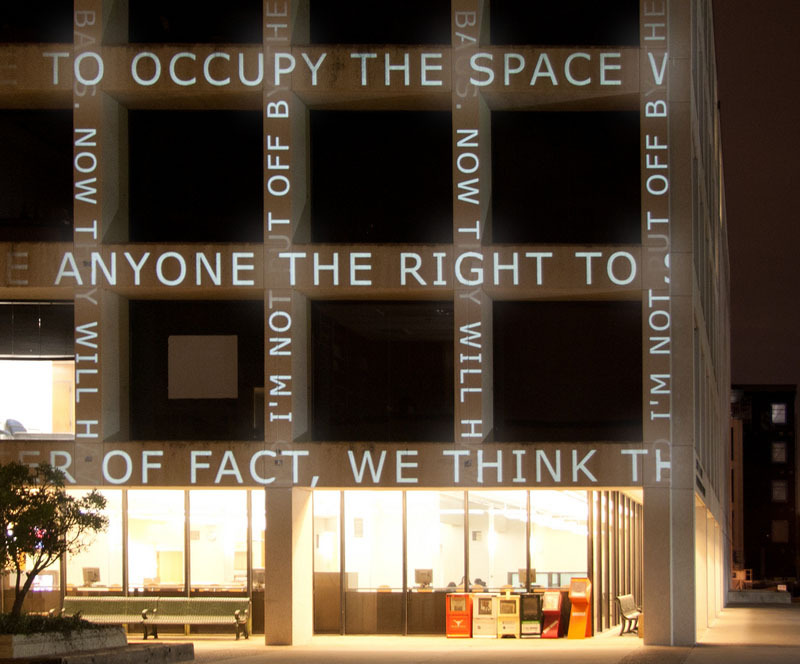 The permanent installation is on display nightly from dusk to midnight on the southern façade of the College of Communication A Building on the UT Austin Campus. Photos courtesy of the Ben Rubin and Paul Bardagjy. This entry was posted in Art, Event, Just Plain Cool, Light, Street Art, Typography. Bookmark the permalink.